The strikes of the merchants of Tehran’s shoe bazaar entered their second day despite heavy security measure. 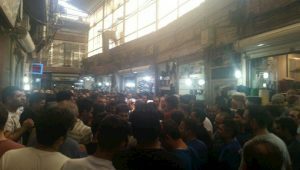 On Sunday, August 12th, merchants in Tehran’s shoe bazaar began their second day of strikes and protests. The merchants are striking due to high prices and lack of access to basic goods needed to do their work. They chanted “Death to high prices!” and “Death to the dictator!” echoing the sentiment of the recent protests that have focused their frustration on economic issues on the regime as a whole. Reports from the MEK network say that security forces have threatened shop owners, demanding that they open their shops. Despite these threats, shops in the bazaar remain closed, and the protests continue to grow. Based on the same reports, the protesters continue to flock to Tehran’s shoe bazaar, despite the heavy security presence. Protesters are chanting “Death to the dictator!” and “Death to high prices!” and calling for other merchants to join them in their protests and to close their shops. The Vahid, Azam, and Kamali shopping centers in Tehran are participating in the strike, but the number of merchants on strike continues to increase. 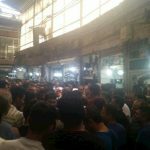 The protests began yesterday in the shoe markets and quickly expanded to other merchants, gaining the support of Sepahsalar, Manuchehr Khani, and Moussavi bazaars. The capital's Seyed Vali shoe market strike. Despite the regime’s attempts to suppress the merchants’ strikes and protests, many shops are still closed, and the bazaar continues to be a scene of unrest. The protests are taking place as part of the larger nationwide protest movement that began in December and has continued since then. Since July 31st, the uprising has swelled again, with an uptick in protest activity after the most recent plunge in the value of the rial. Efforts by the regime to suppress the protests have resulted in clashes between security forces and protesters, in one case leading to the death of a protester, identified as 26-year-old Reza Otadi. The regime has increased its security presence in strategic areas of Tehran and other cities. The people have resisted these efforts and have become bolder in their protests and defiance of the regime.